Pipeline Abandonment - Global Diving & Salvage, Inc. Global was contracted to help perform a pipeline abandonment project in the Cook Inlet in Alaska, which poses numerous challenges including zero visibility and tidal currents in excess of six knots. The team mobilized a four-point mooring system and a deep air diving system onto a landing craft. The vessel was then moored 40ft from the leg of a production platform and directly over a sub-sea oil and gas manifold. This required anchor operations to be conducted in 3 pipeline corridors and near an active production platform. 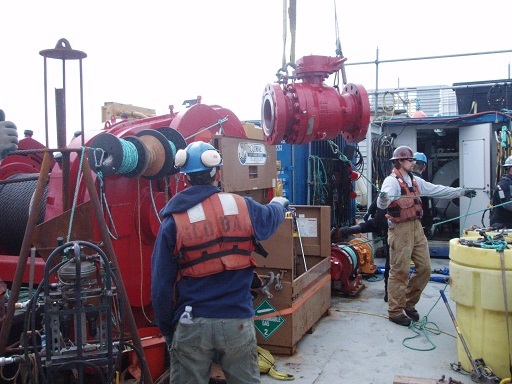 The project involved installing several hot tap installations and disassembling and re-assembling various spool pieces of the sub-sea manifold, which aid in the ability to utilize cleaning pigs in both lines from the platform. All this was done without interrupting flow through the manifold or operations on the production platform that it is connected to.